Yarrow is an herb native to Asia and Europe, which has been naturalized to North America. Today, this herb has become quite popular in natural health education, and is used in a variety of home remedies for various illnesses and disease. Of course, before using it for natural cures and home remedies, it is helpful to learn more about this herb, what it is used for, its typical preparations and to be aware of any precautions that may be associated with its use. Yarrow is a perennial herb commonly found in pastures, older fields and open meadows. It can grow to approximately 10-20 inches in height and is a single stemmed plant. It is rough and fibrous, and the leaves, which are usually three to four inches in length, alternate along the plant’s stem. The leaves also appear fern-like and very dark, which gives them a feathery effect. There are several panicles on each plant that contain various white flower heads, which resemble a daisy. Its flowers usually bloom from May through August. There are a variety of different preparations for yarrow. The dried or fresh flowers are often put into tinctures. Dried flowers can also be made into capsules and teas. For capsules, it is recommended to take them two to five times each day for maximum health benefit, and tinctures should be taken at a Ω teaspoon two to five times each day. 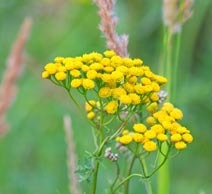 Yarrow can also be prepared as an enema, when it is used to treat hemorrhoids. Yarrow is an excellent herb that can be used in many home remedies and natural cures. In the past, it has been used as a folk remedy for the treatment of chronic nephritis (a kidney disease) and diabetes. Scientific evidence shows that it is effective as an astringent, an antiseptic, a tonic, a stimulant, a diuretic, a diaphoretic (to produce sweat) and as a vulnerary (to heal both old and new wounds). Due to the clotting properties it contains, yarrow is known to help heal bruises, cuts and to slow the bleeding from puncture wounds. It is also excellent for treating menstruation problems, bleeding in the bowels and bleeding ulcers. Compresses made from yarrow are often used to treat hemorrhoids, as well. Since it is an antiseptic, it is often helpful for fighting off bacterial infections, and can help in eliminating congestion associated with coughs and colds. Some may experience sensitivity to the lactone or salicylic acid contained in yarrow. People who have allergies to aspirin may be allergic to this herb, as well. Symptoms of a sensitivity or allergy can include nausea and headache. Because some synthetic drugs do not interact well with herbs, those currently under a doctor’s care should consult with their physician before using yarrow. As a medicinal herb, yarrow is touted as one of the best home remedies and natural cures for a variety of mild to serious ailments. Because of its potency, it should be used very carefully, preferably under the supervision of an herbalist or other health care professional familiar with its curative properties. With natural holistic health being the best way to avoid disease and illness, herbal home remedies also come highly recommended to help in rebuilding one’s health whenever it has been compromised.